After demanding (and quickly receiving) the unconditional surrender of the Allied fleet, the battle was joined in RED/BLUE format. 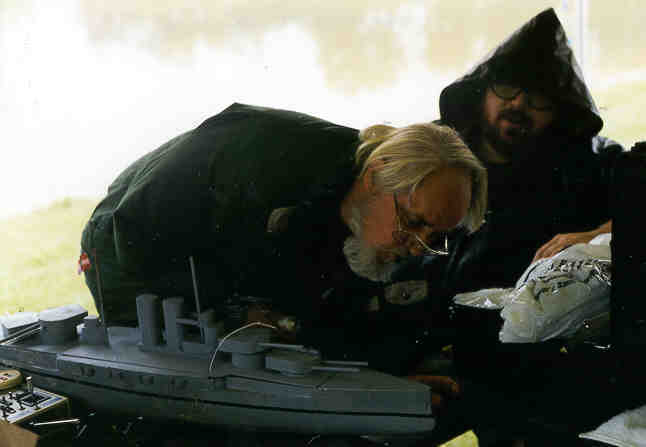 1998-99 IR/CWCC President Marty Hayes confers with Will Montgomery with Marty's Austrian-Hungarian Viribus Unitis-class (AKA "Bacon Maker") battleship Szent Istvan in the foreground. "Don't bother me until I've had my coffee." 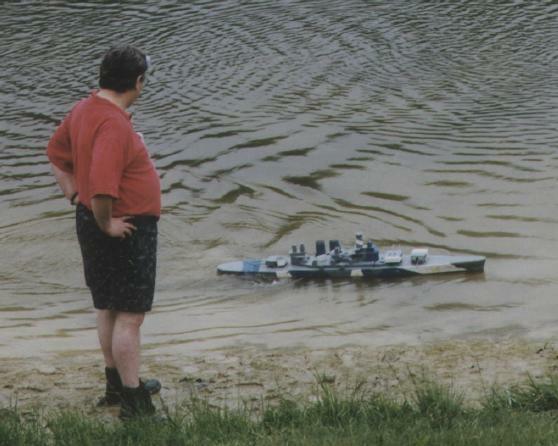 1998 AXIS Admiral Steve Andrews and his (not quite finished) German battlecruiser, the SMS Von Der Tann. 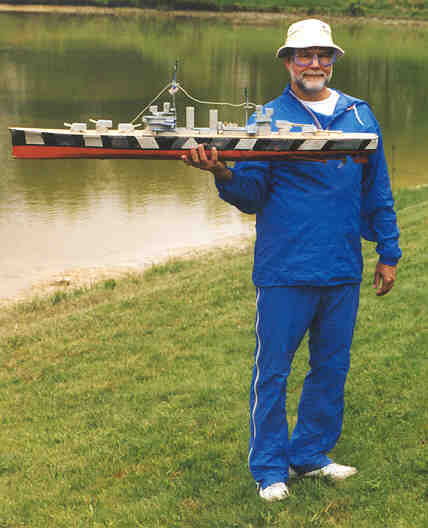 Dave Lewis poses with his son Kurt's Brooklyn-class light cruiser, the USS Pheonix. 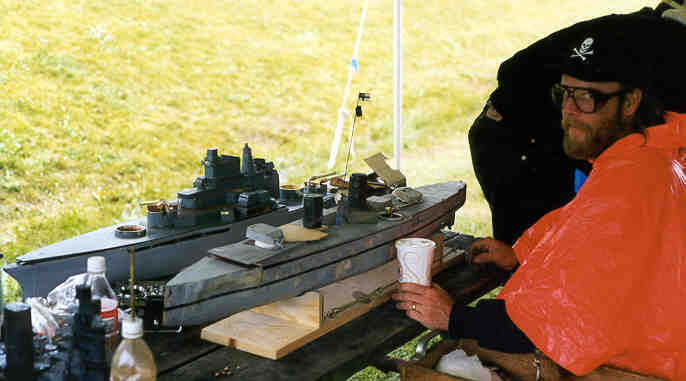 RATS member Cameron Moury prepares to launch the borrowed HMS "Sir Sinks A Lot" borrowed from RATS founder David Ricci. This would be the first official outing of the RATS. 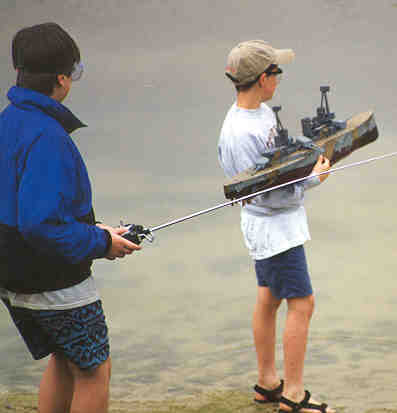 RATS founder Larry Ricci observed the operation of his son David's North Carolina. The "Bacon Maker" Squadron at sea. Left to right are Frank Pittelli's BM #1, Frank's original Bacon maker BM #4 (being operated by Nathan Blattau) and Marty's Szent Istvan. Left to right are ??? 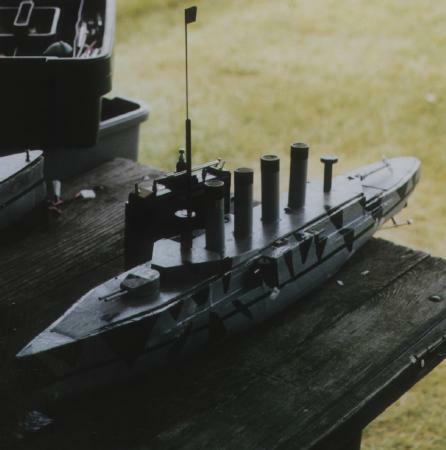 's WWII German cruiser DKM Lutzow, my WWI German Derfflinger-class battlecruiser SMS Hindenburg, and Mike Blattau's WWI German armoured cruiser SMS Scharnhorst. 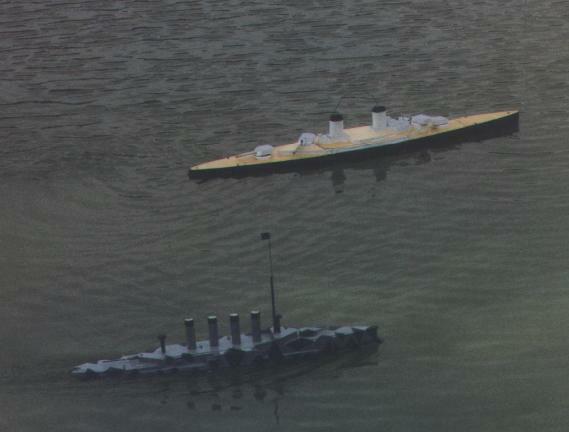 Another shot of the Scharnhorst and Hindenburg. And the Scharnhorst alone. At 2.5 units it is one of the smallest ships to see regular combat service in the Northeast. A major furball developes around Will's IJN Muisashi as FOUR! 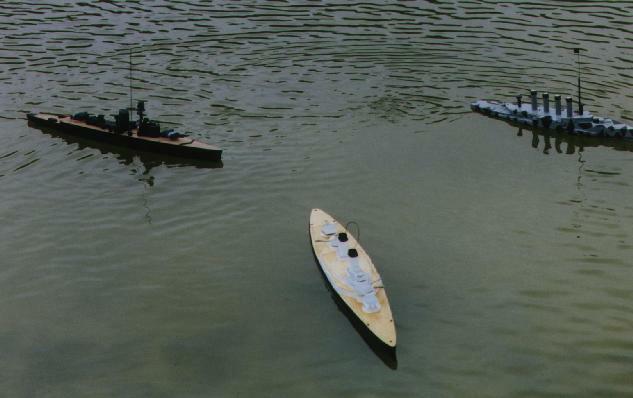 Bacon Makers and the Steve Pavlovsky's IJN Nagato converge on her. 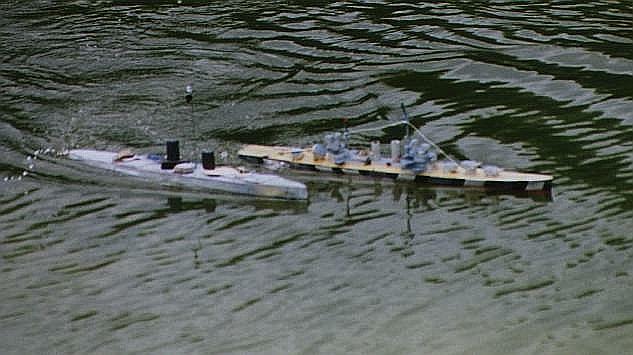 The SMS Von der Tann attempts to unload a sidemount gun into the faster Pheonix. 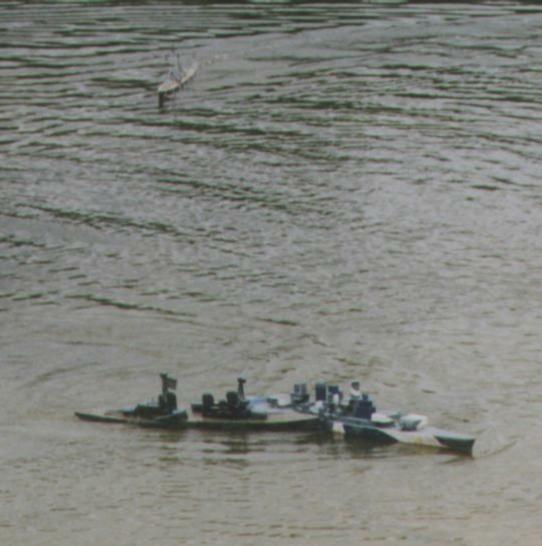 The Pheonix for its part will try to pull ahead, then turn and use its stern guns on the passing "Vonder Boat." Allies just can't help eating their young! The RATS, in their first outing, resorted to fratricide by Sunday afternoon. 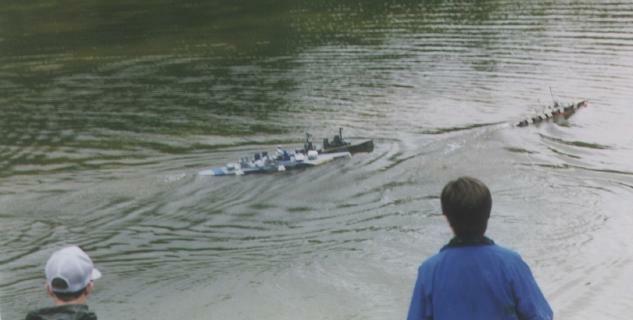 Here Cameron in the I-boat attacks (or is attacked by) David in the NC. RATS Admiral Kurt Lewis's Pheonix looks on with frustration in the background (or is he waiting for an opportunity to attack as well??). The RATS battle continues. 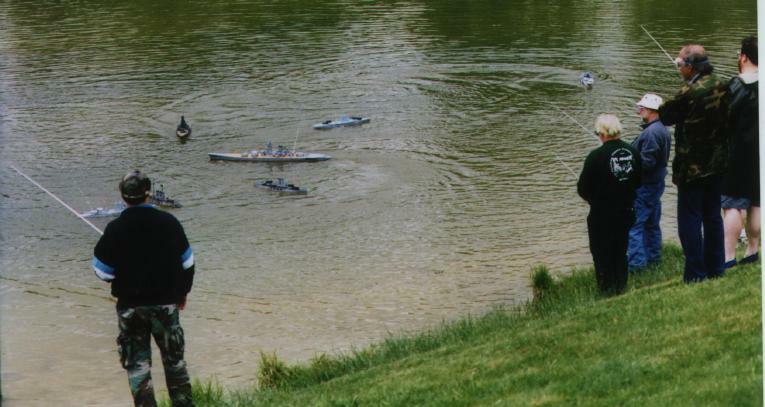 No, Kurt isn't sinking, just heeling from a tight turn.